Although the national bird of Jordan, this finch is named after Egypt’s Sinai and lives in our dry, rocky desert areas. The male Sinai Rosefinch (Carpodacus synoicus) is easily identified by its crimson-pink plumage. Females and juveniles are a greyish brown color. 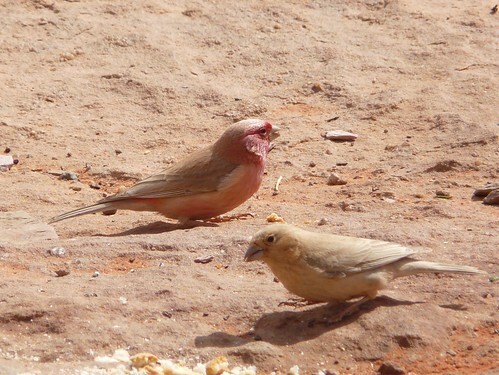 Sinai Rosefinches eat seeds and are often seen in groups. 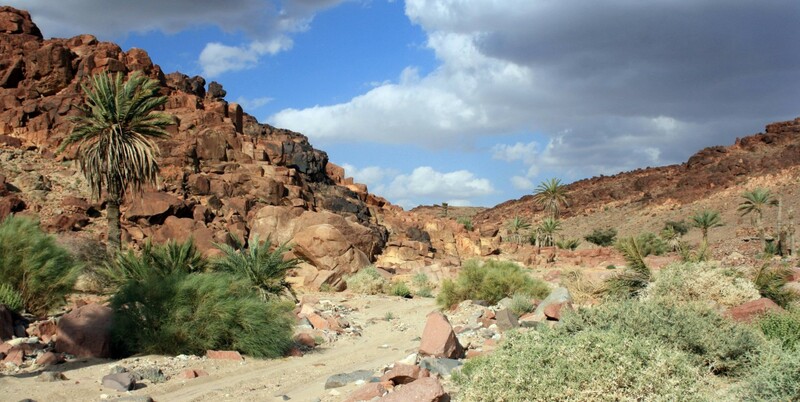 I spotted this group on top of Jebel Musa. These finches grow to about 14 – 16 cm and breed in a small area of Sinai, southern Israel, and southern Jordan. As I’ve mentioned before, photographing birds is not one of my talents, so check out this page with some beautiful images of Sinai Rosefinches and the video below. Smaller birds fear you the most. And imitate with cunning skill. Cruel and vicious, Great Grey Shrike. Six species of shrikes occur in Egypt, including the Great Grey Shrike, and I’ve spotted three of them in South Sinai. Like all shrikes (Lanius sp. ), they feed on insects, lizards, small rodents and even birds. Using their sharp claws, they catch their prey and then impale the corpse on thorns, spikes, barbed wire fencing, or anything sharp that’s around. This has earned them a reputation of being “cruel and vicious”, as well as nicknames such as butcherbirds and jacky hangmen. Impaling their prey helps the shrikes to hold it in place as they tear apart the flesh with their strong bills. It also serves as a way to save the food until a later time, acting like a larder. Shrikes can often be spotted sitting on top of signs, bushes, fence posts – anywhere that gives them a good vantage point to look for prey. Of the six species of shrikes in Egypt, only one – the Southern Grey Shrike – is a breeding bird here. The other five species – Great Grey Shrike (L. excubitor), Lesser Grey Shrike (L. minor), Red-backed Shrike (L. collurio), Woodchat Shrike (L. senator), and Masked Shrike (L. nubicus) – are migrants, passing through Egypt in spring and autumn. Johnson, Julia. (2007). A Bird’s Eye View. Dubai: Jerboa Books. Porter, R. & Cottridge, D. (2001). A Photographic Guide to Birds of Egypt and the Middle East. Cairo: The American University in Cairo Press.